I am still reeling from a decorating disaster that happened this morning. I had just gone into the kitchen to start my husband’s breakfast around 7:30 (NO idea why I was up that early on a Sunday morning!!) when I suddenly heard a deafening crash. I knew right away just what it was, and my heart sank. Nearly every LED candle was damaged (and those things are NOT cheap! 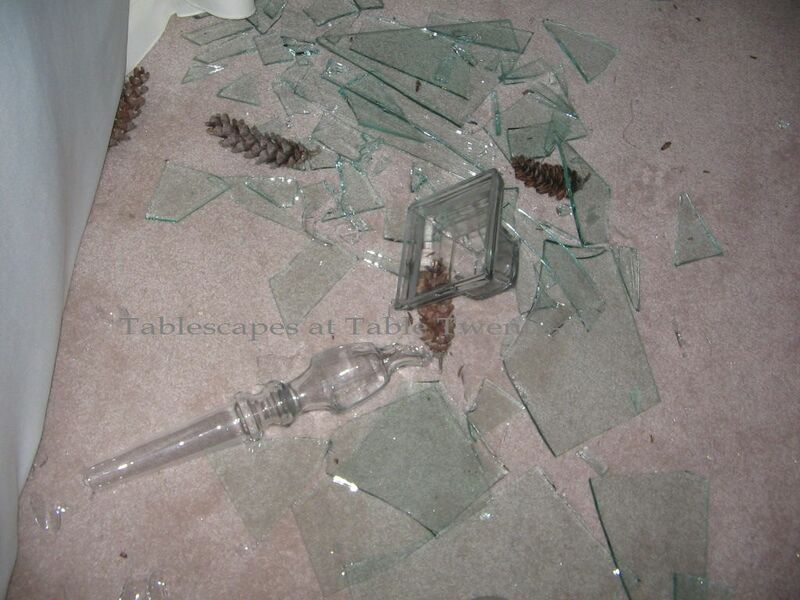 ), and 2 of 4 huge glass candlesticks were obliterated. Luckily, only one crystal goblet was broken at the stem and one (very expensive!) salad plate was broken in two. Lesson learned: ALWAYS use a floral adhesive you trust. I usually use Cling® which provides a monster grip, but I was trying to avoid the ugly green color of it showing through the glass. I used a see-through – but clearly not as effective – adhesive instead. My advice: Just figure out a way to hide your mechanics, and DON’T compromise the safety standards of the composition. I have SO learned the hard way!!! I’m just glad it didn’t happen in the middle of Thanksgiving dinner or while someone was standing nearby. I’m also very grateful I had not yet set all the stemware. The damage was relatively little considering everything in the path of the avalanche. Gotta take out the trash. Gosh…I sure hope I’m able to laugh about this someday. 😦 Tragic. And it looked so stunning. Oh Alycia! Sorry this happened. It was so beautiful. You are a good sport to post the “after” pictures. Oh my dear girl, I can feel your pain. Your centerpiece was a thing of beauty, but fleeting, like a butterfly (desperate attempt to cheer you up) and I am glad that no treasures or priceless heirlooms were broken. But, I know your spirit is bruised, and I also know that you will get back on that horse (not such a high horse, hopefully) and you will create an even lovelier centerpiece. Wow! Sorry, you poor girl. And after feeling bad all week too. Wish you were around the corner. I would have helped clean up that mess! I love the plates, I’m sure you can find another at replacements ltd?? What a shame, Alycia…but you’re right, it was a lucky *break* (sorry, couldn’t resist) that no one was injured in the mess. Ugh! I feel for ya’, honey. I haven’t even decided on my centerpiece yet. Just had the DGD for 3 days & I’m exhausted. I’m going to start worrying about Thanksgiving tomorrow. Have a blessed one & thank your lucky stars it happened TODAY!!! Oh, SNAP!!! This has happened to us all. Yep….every one of us. Do you have a china restorer who could put Humpty Dumpty (that beautiful salad plate) together again? I would still be crying. Hard to be a big girl. 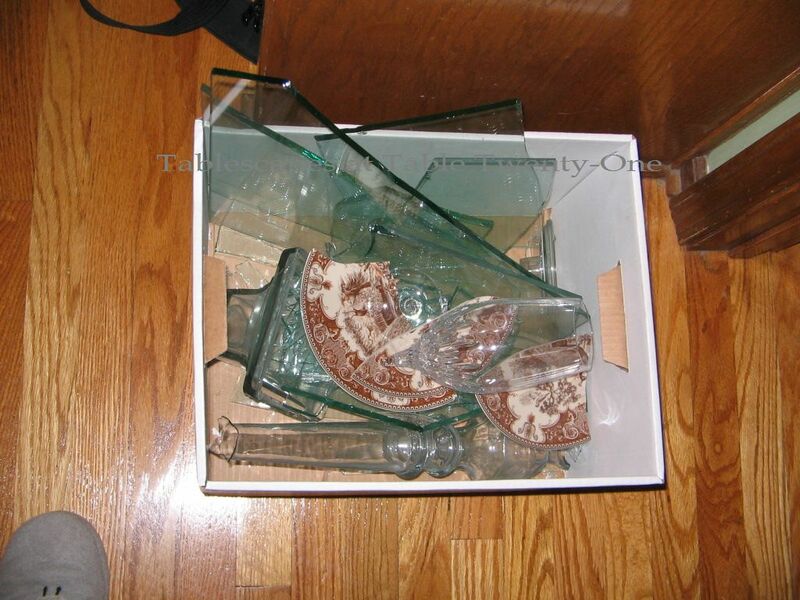 Oh I’m so sorry that your centerpiece collapsed and broke. It was a phenomenal centerpiece. I know the next one you do will be just as phenomenal!! Happy Thanksgiving! Bless you heart! The best thing is that no one was hurt! With your talent, you’ll come up with something quickly. Wishing you a very Happy Thanksgiving! Oh I feel your pain…it’s hard to see all that crystal smashed to smithereens! I had a Christmas tree fall one year with LOTS of dear ornaments collected over the years. We actually bolted the tree to the wall in the corner every year after that for insurance! At least you were ahead of the game and it’s not the 11th hour so you have a little time to plan. Your centerpiece was a thing of beauty~ necessity is the mother of invention and I have no doubt you’ll come up with something equally impressive! Ouch! This is the time to think happy thoughts, say it couldn’t have been worse, dig deep, put your nose to the grind stop… I’m not helping am I? Sending you postive vibes and looking forward to seeing how you make it better than it was the first time. Yikes! Glad your weren’t standing nearby when it happened. You’re so creative, I know you’ll come up with something just as fabulous in no time. Oh, bless your heart! I’m so sorry your beautiful centerpiece fell to pieces! It was beautiful! Is there a way to repair that beautiful plate? I hope so! In spite of all of this I hope you have a blessed Thanksgiving. Thank you also for popping in to see me. OMG it was so pretty -but it is good that it didn’t happen when there were people at the table! I know you’ll have it looking stunning again in no time! Sooo sorry! Your table was gorgeous, I’m sure it was a lot of work!! I think I would have cried. Ok, now that all the bad stuff is over, your luck has turned and everything is going to be smooth sailing!! I just feel it. How about a glass of wine (shoot how about the whole bottle)?? That will make you feel better, at least for a little while!! Glad you were able to save 2 of those beautiful candlesticks, and thank goodness it didn’t happen in the middle of the night. You might have had a heart attack on top of everything else. Thank goodness you got pictures before the catastrophe. The table was beautiful, but I have a feeling that your new table will be just as lovely!!! Are you feeling better?? Hang in there!! OMG!!!!!! SO BEAUTIFUL!!!! !……SO SAD…… It will be a Thanksgiving to remember..(fell like smiling about it yet? )… If I know you, more juices will flow from this tragedy, and you will turn this into a WIN….. and with the inspiration, you will add some SHOPPING DAYS :^) to your HOLIDAYS looking for more CRYSTAL REPLACEMENTS!!!!! 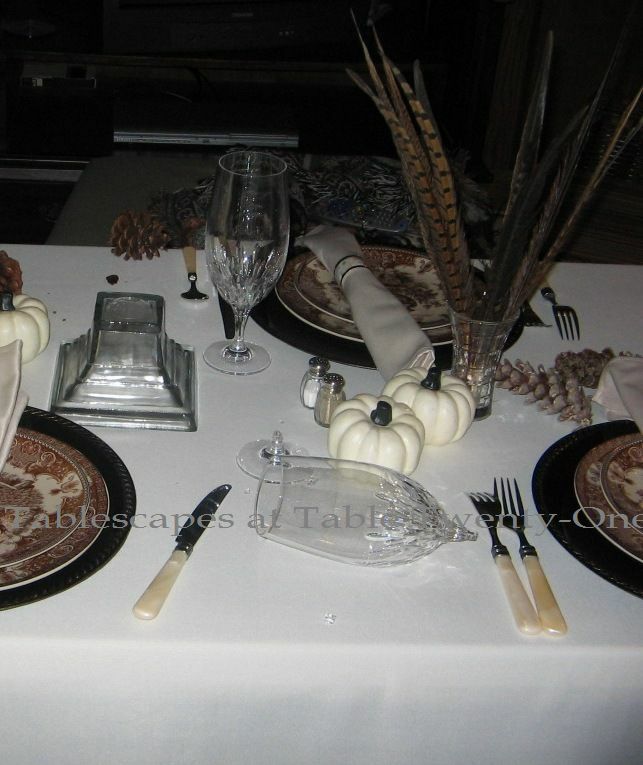 Looking forward to your THANKSGIVING TABLEAU!!!!! HAPPY THANKSGIVING MY FRIEND!!!! Oh, I’m so sorry! I’m just glad no one was hurt. I’m sure your table will be beautiful on Thursday, even though you have to develop a Plan B! You’ve been sick, you get this far in your progress, and then…catastrophe. Surely this is the final test for you this week! 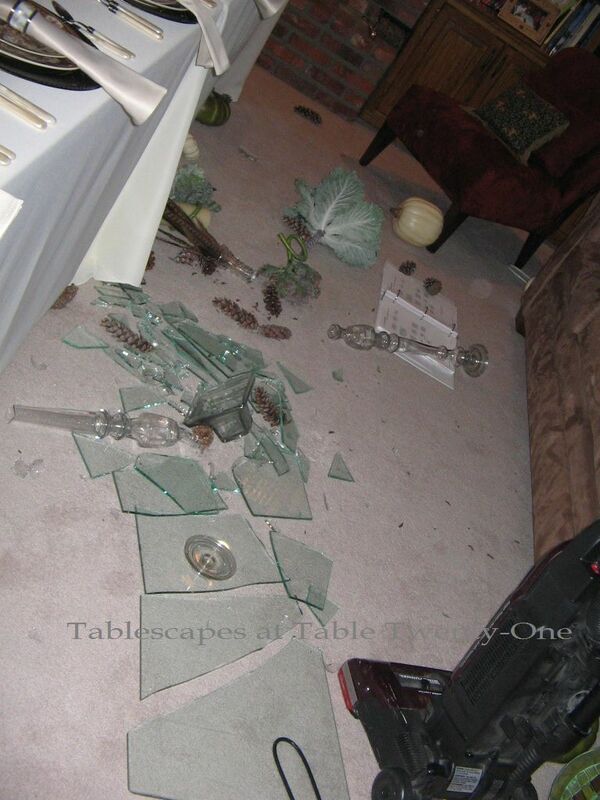 I’m thankful that it not only didn’t happen when people were around, but also the food, because your whole meal would’ve been ruined with the broken glass, then you’d have an angry, hungry mob on your hands too! Knowing you, by now you probably have some equally fabulous centerpiece done, but I AM sorry you had to go through all this. I hope you’re feeling better. Best wishes for a happy day when the family gathers, Alycia. Oh, my! That sickening sound is so identifiable! Well it sure was pretty! Hope the rest of your Thanksgiving goes flawlessly. Oh no!!! That’s is exactly the kind of thing that happens to me. I will admit that I do not handle it graciously, either. Sigh. I appreciate the tip on a product that you DO trust and will take your advice. But can I say that the one picture you do have of the table is just plain stunning? You should have saved the glass and mess. With your talent, I’ll bet you could have turned it into an entire table theme. Hugs to you and HAPPY THANKSGIVING anyway! Oh Alycia, I’m so sorry about this! My goodness, I can just feel your pain. We do love our little treasures, don’t we? Maybe too much sometimes, but we’re only human. All that work you did on this elegant table, and to have it ruined is bad enough. But then to have some of your expensive pieces broken beyond repair is heartbreaking. Again, I’m sorry to read this. Take a big breather today, and then maybe you’ll feel like starting again. I hope your week gets better! I’m sorry for your loss and it was so lovely before the earth trembling and sending all to the ground. You don’t need to laugh later but be thankful it happened when no one was around. Wow..my dear girl ! I’m so sorry! I can feel your pain dear. Your Thanksgiving table was so very beautiful. Hope you are better now. A very happy Thanksgiving! You’re okay, not hurt, at least not physically….Ramon is fine too. I am thankful no a soul was hurt because it could have been worst. I know Thanksgiving will be great at your house and the food DELICIOUS! Oh my gosh – I am so sorry to hear that! It looked so pretty too! At least it didn’t happen when you had a crowd full of people at the table. Thanks for stopping by to see my little table. At the moment I am pulling out all the extra leaves and chairs for our big crowd for the “real” table setting! I guess you have quite a crowd too! Have a wonderful Thanksgiving! At least your disaster will give you an interesting story to tell your guests. You can show them the picture of what it was supposed to look like! Alycia, so sorry for your fiasco. Oh, my gracious! I do appreciate you sharing your experience and keeping it real for us. Your tips are much appreciated and will help the rest of us to avoid a similar experience. 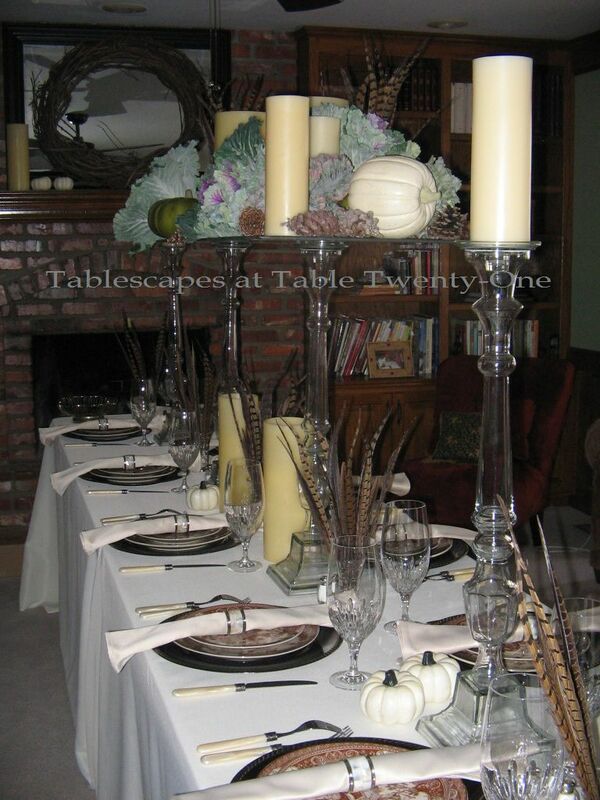 I know you will still have a stunning Thanksgiving table. Enjoy the day! Oh cra@&$$! I am so sorry! I would be screaming! OMG! It was beautiful while it lasted. Soooooooooooo sorry.